Betsy Osoffsky serves as second violinist of Quartet Louisville and is also active as an orchestral musician. She is currently a member of the Owensboro Symphony and previously served as concertmaster of the Southern Baptist Theological Seminary Orchestra and the Jewish Community Center Orchestra. She has been a member of the Columbus (OH) Symphony, Pro Musica Chamber Orchestra of Columbus, and the West Virginia Symphony, and has also performed with the Louisville Orchestra, Fort Wayne Philharmonic, Evansville Philharmonic, and Bedford Springs Festival Orchestra, among others. Betsy enjoys playing shows and has performed with the Broadway Series, Music Theater Louisville, and Derby Dinner Playhouse. She has also played with the Louisville Bach Society Orchestra as well as various other choral organizations in both Louisville and Columbus. She has a Bachelor of Music Education degree from Capital University. 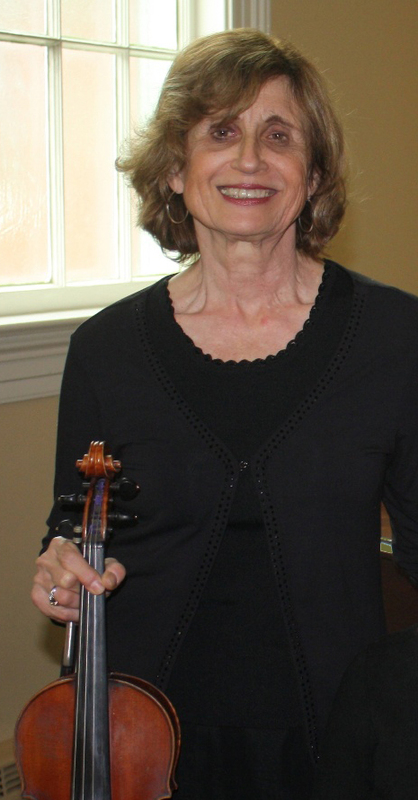 Lorna Larson, founder and first violinist of Quartet Louisville, received her violin performance degree from Cincinnati College-Conservatory of Music, where she was a full scholarship recipient. Her Master's degree is from Colorado State University. She has had many years of full-time orchestra playing with the Oklahoma Symphony. Other orchestras include: Alabama Symphony, Central City Opera Orchestra (CO), Fishcreek Wisconsin Festival Orchestra, and Mineria Orchestra (Mexico City). She has also performed concerts throughout Europe with Quartet Oklahoma, the university's faculty string quartet, and toured the Southwest with the New American Ragtime Ensemble, which also performed on the Oklahoma Symphony's "Pops" Series. Following the demise of the Oklahoma Symphony in 1989, Lorna became the assistant concertmaster of the Oklahoma Philharmonic Orchestra. More recently she was solo violinist with the National Tour of "My Fair Lady." In Louisville she has performed with all the major musical organizations: Louisville Orchestra, Broadway Series (Beauty & The Beast, The King & I, Ragtime, South Pacific, Evita, to name a few), Louisville Bach Society Orchestra, and Actors Theatre (Coconuts, Wizard of OZ, Peter Pan). She has taught violin at several universities, including the University of Louisville. Two sons and a daughter call her "mom," and there are 8 wonderful grandchildren. Robin (Roberta Sprenkle) Chappars, cellist, is a native of Rochester, NY, where she studied at the Eastman School of Music. She has played professionally with the Newark (DE) Chamber Players, the Lancaster (PA) Symphony, the Delaware Symphony, the Bowling Green Symphony, Music Theatre Louisville,the Louisville Orchestra, and Derby Dinner Playhouse, and is currently principal cellist of the Louisville Philharmonia Orchestra. She has taught at the Louisville Academy of Music for over 30 years, and is a founding member and the business manager of Quartet Louisville.